Dragongate: Amazon Adventure. # 6. We turn left to cross Florida by River. Amazon Adventure. # 6. We turn left to cross Florida by River. From Fort Meyers we joined the Caloosahatchee River system. 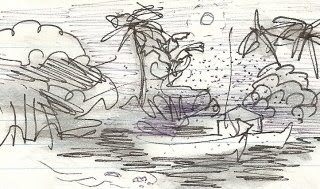 No more tides stranding us for a while, but we do find a new set of problems: bezillions of insects that love us ( to eat). We have our first experience of passing through a lock and stop overnight in the town of La Belle. Here we meet a fellow cruiser (the first in a long series) who has actually been to the Bahamas and reassures us that we will have a great time there. He gives me his copy of the Bahamas Cruising Guide which I will read over many times before we eventually leave Florida. The ‘river’ we are following is mostly dredged straight channels and we are lucky to have following winds to hurry us on our way toward Lake Okachobee in the middle of Florida. The lock raises us four feet. Up early in a nice little bay among some mangrove islands. 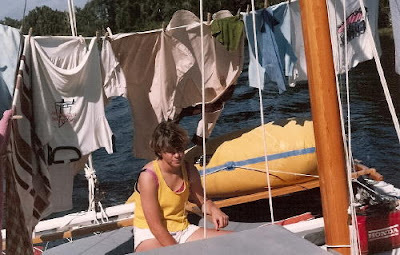 I had a splash bath on the foredeck while the ladies did a complex bathing ritual in the tent. We motored up river to our first lock: a new experience holding onto a line as we were raised a whole four feet. 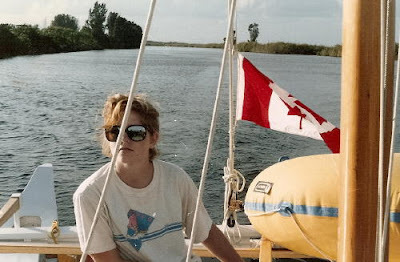 Anne sails us up the river. Here I sit with a steady rattle of bugs trying to get in. We had a mosquito attack and finally made a smudge in the coffee pot to cool their ardor. Anne is tending it now. Elaine and Gwyn are in one hull doing a French story and Heather is making chilli and rice. We are anchored in a swamp, but a very beautiful, if buggy, swamp along the edge of Lake Okachobee. We have had a good day starting under the noisy bridge at La Belle and a quick stop at a marina to top up with gas. By 12:00 we were all starving because we had corn flakes for breakfast and not good porridge that sticks to our ribs. We nosed into the shade of a large pine on the river bank ( this is open ranching country) for a lunch break and listened to the wind in the branches. We decided that the wind had come round to the point where we could sail. Got the big genoa out and away we went. Elaine and Gwyn steered while I dangled my feet and tended the sheet. Presently we arrived at the lock that lead to the big lake. 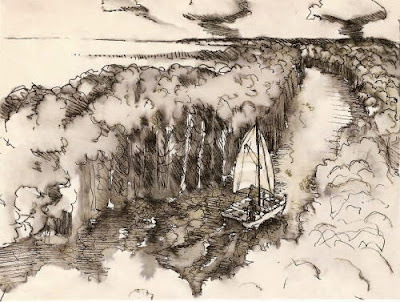 Soon we were sailing quietly along the edge of a vast reed and grass swamp. Many strange birds. Bill. Dec. 11th. Woke up this morning to another massive mosquito attack. 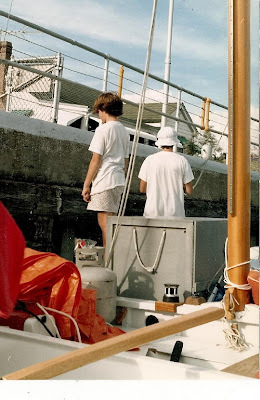 Bill and I decided to move out into the channel to find a breeze but for the first time the engine would not start (too misty and damp I guess). In the end we got the girls up, took down the tent and we all paddled slowly and laboriously past a couple of men who should have been tending a sluice gate. We paddled around the corner and settled down in a bug free environment to bath and wash all our bloody and dead-buggy clothing. One of those men then showed up to offer us help, coffee, showers etc. Bill trotted off to see about a motor repairman (too expensive) and came back with a bunch of finger bananas. By now the sun was hot, the engine ignition wires dried out and the engine started. So we had a super day mostly sailing with the genoa along incredible avenues of eucalyptus . Seeing alligators and birds we have never seen before. Lots of sugar cane fields which were being burned off prior to harvest. Elaine steers swathed in laundry after the bloody mosquito night. 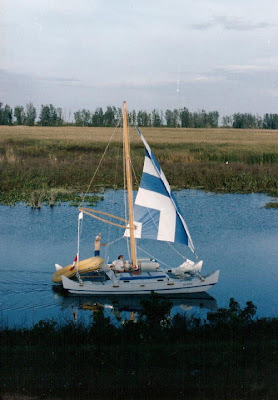 We stopped at the little lakeside town of Pahokee where we were now out in the open lake and moored behind the breakwater confident that the predicted ‘norther’ would not arrive and we would get a good night sleep minus mosquitos and wind. But it was Friday night and party time and what a party they had too up on the levee behind us until it was too late and the wind was beginning to rise.... Heather. 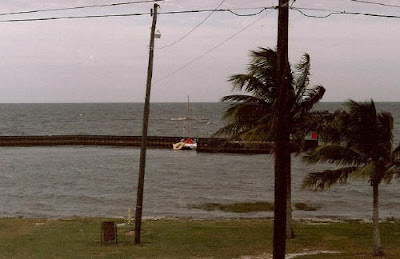 Amazon behind the breakwater at Pahokee on Lake Okachobee.